To Carroll, the biggest offseason story might involve one of the team’s most proven players — Wilson. “He’s made a clear step ahead, and his command is like all time,’’ Carroll said. RENTON — The focus during an NFL offseason inevitably falls on the unanswered questions, the competition for position battles and new players. 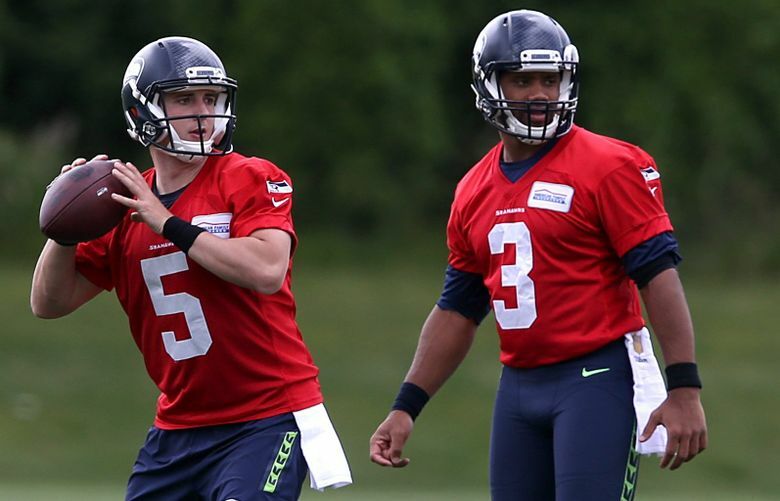 But in the eyes of coach Pete Carroll, the biggest offseason story might involve one of the team’s most proven players — quarterback Russell Wilson. As the Seahawks concluded their three-day minicamp Thursday, a session that also ended the team’s roughly two-month official offseason program, Carroll was left raving about the progress of Wilson as he enters his fifth NFL season. Carroll’s comments came after a practice in which big offensive plays were the norm. Offseason workout rules favor the offense — there’s no contact and no pads. Still, during some of the passing drills the ball hardly seemed to hit the ground. At one point, Wilson threw a 30-yard touchdown to a streaking Tyler Lockett, who had gotten behind cornerback Richard Sherman. Wilson also hit a leaping Kasen Williams in traffic for another score. Reporters don’t see every workout, and when Carroll was asked afterward about the apparent efficiency of the passing game Thursday, he said that was the norm. And the way Carroll sees it, Wilson is set to answer every question about his ability to lead an offense with his arm. Wilson is entering Year 5, already with one Super Bowl title and a slew of team records under his belt. He threw for 24 touchdowns and just one interception in the final seven games of last season. His 34 touchdowns were a team record, as were his 4,024 yards and passer rating of 110.1. “It’s a culmination of that, it’s taken all this time to get to this point,” Carroll said. “And he will still improve. You can really see him as a real, true vet now. The second-half outburst came after the Seahawks shifted their offense during their bye week, deciding to emphasize quicker passes, timing routes and spread formations. They were especially successful with empty sets (no running backs in the backfield). Throwing passes more quickly also helped mitigate some of the offensive-line struggles. Wilson was sacked just 15 times in the last nine games after the Seahawks allowed 31 in the first seven. Carroll said to expect more of the same in 2016, the first season since 2010 without running back Marshawn Lynch as the focal point of the offense. Wilson is known for his strenuous offseason workouts, and he said a focus as he gets older — he turns 28 in November — is his legs. “I want to play 15-plus more years, and a big part of that is taking care of my legs and getting stronger, but also getting more flexible, more mobile,’’ he said. The way Carroll views it, though, Wilson appears ready to truly come of age.